Since the 1980s-1990s, all countries in the world have incorporated the early development of 0-3years’ old infants into the government's public services, and implemented the early development national action plan for the poor. The views that “the development of early education is to build national wealth” and "the investment in early education is the investment for the future" are more and more widely accepted. However, the condition of early education in China is not optimistic, and the traditional family-based informal tending mode is more and more difficult to effectively fulfilling the responsibility of scientific raising or nursing the infants, which need the policy and service support from the government and society. This paper attempts to answer several theoretical questions relating to the nature and deification of early childhood care and development for children aged from 0 to 3, the responsibilities and relationship of the government, market and family, and the building of the development service system for infants’ early education in a market economy. It puts forward specific policy advices in light of China’s conditions and foreign advanced practice. The significance of this research is to explore how to improve the quality of population and the inclusive early childhood development services covering all social groups, how to reduce the costs of raising infants, how to strengthen the community and social services, and guide the development of private education from the source. The characteristics and innovative ideas of this research lie in the following aspects: first, it takes the policy perspective of a developing society, and puts forward practical policy options; second, based on China's economic growth in the transitional period and the further reform of people's livelihood, it explores, with a forward-looking approach and targeted manner, how to formulate a fair education and health policy with accumulated and fully improved human capital, third, it makes a detailed and comparative study of the research findings both at home and abroad; fourth, it focuses on the analysis of stakeholders. 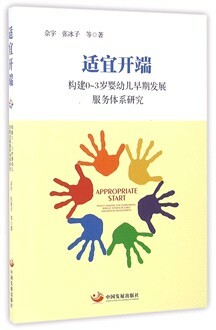 The first part of this research is a general report; the second part is a case report on early childhood development in Qingdao, Nanjing, Ordos, Daxinganling region, Shanghai and Taiwan; the third part is an illustration of the background of the research, including a development overview of early education in the world, the background, approach and enlightenments of the government’s intervention in early childhood development, an analysis of 0-3 years old infants’ early development and the comprehensive intervention in the poverty areas, and the questionnaire analysis on the early development of 0-3 years’ old infants. The postscript is related to the foundation of the growth of children.